Regular readers of MotoringFile learned ages ago that MINI is developing an SAV (sports activity vehicle) for the 2011 model year. The news broke yesterday about MINI’s new Crossover Concept car, which will give us a good window into what to expect in late 2010 debut of the Crossman Countryman factory car. BMW and MINI generally follow a pattern of releasing concept cars about 18-24 months before releasing a factory model based on that concept. The Crossman, known internally as the R60, will reportedly be a shared platform between BMW’s X1 (the 1-series baby brother to their X3 and X5 SAVs) and MINIs Clubman wagon variant of its iconic Cooper hatchback. Expected features include four doors, all-wheel drive, and possibly even an ultra-efficient diesel engine option. Reports from MINI are that the AWD system will not be a sport-tuned symmetrical system akin to the Subaru WRX, but rather an as-needed system to assist in low-traction situations. I don’t think anyone expects this “soft roader” to be suited for anything more adventurous than Midwestern pothole dodging, but that extra level of traction appeals to an ever-growing number of car buyers, especially those of us with real winters. The inevitable, negative discussion on MotoringFile began right away with the expected cries of horror. “Oh it’s so ugly!” “This is killing the Mini brand!” and other shrieks of flaming lament. Were MotoringFile not a growing ad hominem wasteland, I’d probably jump in the fray. But no thanks. Every time MINI unveils anything new or different, it’s met by this bandwagon of tripe. There are still a few sensible chaps hanging ’round and participating, but they’ve got more patience than I do at this point. Godspeed, good sirs. Knee-jerks aside, there are a couple of valid questions surrounding this new MINI model. Does a MINI have to be small? It’s tough to expand who you are as a car company when you’ve been named an adjective. Being called a MINI doesn’t simply imply being small, it practically demands it. The original Mini Cooper was a downright tiny car by today’s standards. The first generation of the “new MINI” was actually received very coldly by the die-hard fans of the classic car in Europe. Chief among their objections was how much bigger the BMW/Rover MINI was. This is the generation of MINI that I own (internal model R53), and it’s roughly the size of a BMW 3-series coupe, but shorter in the rear. At the time, it was the smallest production car available in the United States. Since then, with the newest, all-BMW generation of the MINI (the R56), the car has grown by a centimeter here and there, but also lost nearly 100 lbs in curb weight. Not a bad trade off. The R50/R53 fanboys (myself included at first) were not big fans of the R56 when it debuted [for us] on MotoringFile. A consistent gripe was that the car was a bit bigger. This “alarming” trend became an ongoing topic of contempt and fully exploded when MINI announced their plans to revive the extended wheelbase version of the Mini Traveler in the form of the MINI Cooper Clubman. Although the car grew neither in width nor height, the hemming and hawing began right away about how this size increase was “killing the MINI brand” and “Oh it’s so ugly I’m going to sell my Cooper S!” and on and on. I can’t help but wonder what these knee-jerks would do if MINI revived a couple of the other classic Mini models like the pickup truck or the Moke. Regardless, the Clubman has been a smash success. Looking at the specs for the MINI Countryman-to-be, the MINI Crossover Concept, this new MINI will be approximately six inches larger in every key dimension when compared to MINI’s iconic Cooper hardtop coupe. This according to the official press release. That doesn’t exactly put it into H3 country. In fact, that means that it’ll only be marginally larger than the Clubman. I think that should still squarely count as small. Especially when you look at it in the context of other crossover SUVs on the American market — where this model is squarely aimed. The Ford Edge is nearly the size of the BMW X5. The Toyota Rav4 is much bigger than it used to be. The Mazda CX-7 is the size of their 6 sedan. None of these are small. 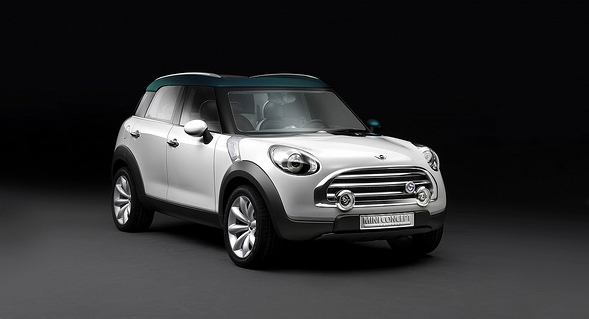 But in looking at the MINI Crossover Concept dimensions, it’s not much bigger than the MINI we know today. Which means it’ll be very small in its market segment. I suppose that doesn’t really answer the question though. Does a MINI have to be small in order to still be a MINI? WhiteRoofRadio.com interviewed Gert Hildebrand, head of design over at MINI in Germany, for their podcast during last year’s MINI United event in The Netherlands. They asked him specifically about a 4-door model and what size meant in terms of what a MINI is. That’s a great answer, and it doesn’t get more from the horse’s mouth than that — from the actual professional in charge of design at MINI. According to Gert, context makes a huge difference in what makes something a MINI. To expand on that idea, I think that the MINI goes beyond simply being smaller than other cars in its class. Rather, I think it’s much more space efficient than other cars in its class. The original design spec for the Mini was to create a small car that maximized interior space, allowing a very small and economical car to be truly practical to drive. That meant pushing the wheels to the corners. That meant mounting its engine transversely (parallel to the front wheels). That meant an upright windshield — all to maximize interior space. Fifty years later, my car is the same way. Getting into it is like a magic trick. “Where did all this space come from?” So in that sense, a MINI SAV, or MINI pickup truck, or MINI personal hovercraft, becomes less about rote measurements and more about space efficiency. There are two other themes that run deep to what MINI is all about. Economy, and especially performance. Motor Trend described the R53 as “an exotic sports car masquerading as practical transportation.” MINI pigeon-holes itself as a “premium small car” and I think that’s spot on. It’s not luxurious, but simply nice in a way that few other small cars are. There’s real care taken in the aesthetics. It goes beyond the toaster appliance experience of most economy cars. Simply put, a MINI’s got soul. It’s also got guts. My car goes like stink and corners like it’s got saw blades for wheels. Yet still gets north of 30 mpg. Not too shabby. Second question. Is a MINI SAV in line with those values? That’s the really philosophical question. I don’t think anybody who’s paying attention can say that a car with MINI’s premium outlook on features, safety, design, and economy, in a 4-door package, with AWD wouldn’t just sell like crazy in the US. It probably won’t be a big hit in Europe, but they’ll probably be lined up around the block to buy them here. This has led to accusations within the MINI enthusiast community that MINI is only making this car to pander to the poor tastes of American car buyers who’ve been brainwashed into this notion that they need off-road capability in their daily commute up the freeway. But is that what MINI is really delivering here? Yes, it’s based on the X1 platform, but that’s simply based off the 1-series BMW sedan. Given the alternatives and MINI’s very cheeky nature, doesn’t a micro-SUV simply make more sense than some sort of small sports sedan? There are tons of those on the market. MazdaSpeed 3, VW Jetta GLI, Honda Civic Si Sedan, Mitsubishi Lancer, and those are just the sporty ones. That’s a pretty crowded market space. But what SUVs of this size range even exist in the US market? The Rav4? The FJ Cruiser? Kind of, but you can’t claim any sort of sports car performance out of either of them. They’re also both still bigger than this MINI SAV will end up being. In general principle, I would say no, an SUV or SAV or whatever you want to call it doesn’t exactly jive with MINI’s heritage as small, sporty, stylish, economical transportation. But in execution, this MINI Crossover Concept pretty much has me sold on the idea. It’s completely MINI. In fact, my first reaction in seeing it was utter surprise at how much the big front grill looked like the classic Mini face. In a lot of ways, this car looks more like the classic Mini than the current iterations of the Cooper. So is this SAV a MINI? Abso-friggen-lutely. Obviously, the production car will be much more conservative than this. It won’t have the funky sliding door or the rear tilt gate, which is kind of a shame. It probably won’t have the modular rail up the center, and I would expect a more traditional bucketed bench seat in the rear to accommodate a 5th passenger. It certainly won’t have the Ferengi mind control ball as the dash interface, but I expect it will have an interior unique from the Cooper and Clubman. I do hope it retains a center-mounted instrument panel. Overall, I think it’s just slick as can be. I picture one with a kayak on the roof rack, the diesel engine growling out massive amounts of torque, towing a trailer with a pair of scooters on it. Sweet. I would love to have one of these. Sadly, it’ll probably be north of $30k to spec one out like I’d want it. There are a lot of very nice cars in the $30k range. Lots of E46 M3s to be had. But if I got to where I wanted to haul stuff and people, or felt like I needed AWD to navigate the frozen north of Minnesota, the MINI Crossover would definitely be on my short list. Check out the full unveil over at MotoringFile. Nathaniel – brilliant analysis. My wife and I had an eerily similar discussion last night on whether or not the Crossover Concept is diluting the MINI brand like so many people have commented. My wife’s title at her firm is Brand Navigator (I know, very progressive) so I decided to get her take on the whole idea. She basically said many of the same things you said here. From a design standpoint you are spot on in your analysis. I think it’s time we all had a discussion as to what defines the MINI brand. Is it size? Is it design? Is it performance? Is it lifestyle? Or is all the above and more? I believe we’ll be talking about this for some time to come over at WRR. Maybe we can schedule a guest spot for you sometime to share your astute perspectives. Wow, thanks so much Todd. I really appreciate that feedback. I’d love to talk with you guys on WRR about anything — MINIs, iPhones, Top Gear, whatever. I’ve been listening to you guys since about episode six, so it’d be a huge honor to chat with you guys on the show. I’m completely at your disposal. Nathaniel, excellent analysis, and while I may not find myself in full 100% agreement with you, it is a pretty respectable opinion nevertheless. I often wonder what has happened to the concept of “Agree to disagree”. I guess it is our highly charged and deeply divided political environment that has fostered a mentality of nearly zero tolerance to opinions and views that are different from ours. And please do comeback to MF. Your opinions and highly valued over there. Nathaniel that is one of the best articles I have see online in a while, just had to say to keep them up. I certainly don’t fault MotoringFile for the inane commentary of some of its readers. It’s the price you pay for getting that popular and being an open forum. I still read it and still appreciate what some people have to say. I’m just going to keep out of the comments unless there’s more than just assholes yelling at people who don’t share their narrow little opinion. What’d you think of the Crossover Concept? I’d be really interested to know what you see differently? Nathaniel, you can see my opinion on it on a humble post I made yesterday. Just read your breakdown over on MF. Good stuff. So long as they don’t cut too many cost corners, I really think MINI’s got a winner here. If the X5 is any indication, I imagine it’ll handle better than it ought to, just like any MINI. Thanks BVR, I’m very interested to see what the final trim of this car will be, as so many of the details will of course change. If it’s not arduously expensive, a Crossman might very well end up in our garage as well. We’re looking to replace my wife’s Tacoma with perhaps a used Matrix or some other versatile car that gets good mileage. Perhaps that will hold us over until the Crossman hits the streets. Something tells me I might want to get on a waiting list early. Excellent analysis. You just “open” my eye. I guess too that size & description are “relative”. I’m glad you recognize those few of us who’ve tried to keep these new releases in proper context. It always seems as though the core group of MF commentors skip the primary purpose of these “concepts” and automatically assume that their current guise is an inevitable fact. I, sadly, weep at the stupidity of these forum flamers and the loss of your informed rebuttals. I have always looked to your comments as a steadying force. Thanks James. I really do hope that those of you with real things to say in the comment section can continue to stand up and defend MotoringFile against the comment flamers. For a long time, it’s been one of the few places where that crap didn’t really go on, but lately it’s just gone down hill. But I lay that responsibility squarely on the knee-jerks. I certainly don’t feel like I can’t contribute meaningfully there, I just don’t want to bother if the thread has gotten toxic. My exile is self-imposed. Ha! But if I feel like I’ve really got something to say, I have my own venue for that now, which is also cool. It’s great that db has used this to keep me plugged in to MotoringFile in a different way, though. I really appreciate that. Perhaps I can look toward being more of a contributor and less of a commentator. It’s a sad attempt and a large sad attempt at that. Sorry I can’t jump on the Salzman-wagon on this one. If they build it will anyone buy it? Of course, it will sell! There are so many different tastes out there and not all are MINI-crazed. If they buy it will I care, nope! It’s not my job to dictate or care what others buy so have fun. BMW is just trying to sell cars. I think Mr Issigonis would be appalled. I have grown to “TOLERATE” the Clubman. I’ve even thought of buying one but there’s just something untidy about the thing. I still may buy one as I need one for transporting my goods to meets like AMVIV and others and bringing the wife’s A4 just doesn’t look correct nor is it any fun to drive. Nice write up, I enjoyed the read. I guess I’ll be throughly trounced now. RB, you’re certainly welcome to not like it. Rage on. I think the biggest thing we have to keep in mind is that what a MINI is or isn’t doesn’t really belong to us. We (at least most of us) own MINIs, but we don’t own MINI. We’re passionate about the brand, and that’s awesome, but ultimately it’s the opinions of people like Gert who get to decide what is or isn’t a MINI. That’s the crux of what I wanted to get to. I don’t want to simply relay what MY outlook is on what I think is or isn’t a MINI, but rather try to reverse engineer what has been authentic to the nameplate through the years. The MINI is a premium small car — not because I’ve decided that’s what makes a MINI a MINI, but because some very smart people in Germany and England decided that that’s what MINI should be about. The idea that you and I are MINI is great branding, but the reality is that what makes a MINI a MINI, is up to MINI. Do I get some sort of award for using “MINI” four times in one sentence? Very well said, Nathaniel! I’m not a fan of the Crossman but I can fully appreciate what MINI is trying to do with the R60. I love my R53 and prefer it to an R56 but in the end they are all great cars. I think MINI has done an excellent job designing and delivering some outstanding products. I didn’t want my comment to seem like a RANT. It’s just how I see the whole thing. I definitely don’t think I own MINI that’s for sure and I felt my comment was respectful of those that love MINI as it was, as it is and as it will be. In my view it just BMW supersizing everything they touch, am I wrong? Need an SUV/SAV or whatever you want to call it in the MINI brand? Don’t think so, IMHO. Need all wheel drive, well thats a MINI of a different colour now isn’t it. BMW will do whatever they want no matter what we think, but as some of our USA car companies found out you can only make the wrong stuff for so long. I’ve been a long time reader of MF & BF, but very infrequent poster as up until recently I was a manager at a BMW & MINI dealer and thought it maybe (professionally) inappropriate to join the debate. Whenever I came across your posts, I was consistently struck by two thoughts; how eloquent and informed your comments were – irrespective of subject matter, and how similar our opinions were, even taking into consideration my inevitable bias! I love the Clubman, I love the R56, and I think this Crossman will be superb. It is evident that you are a scholar and a gentleman, and I just wish that a few more contributors to two of my favourite websites would take a cue from you, and be just a little more considered in their diatribe! This crossover will still be small. Let’s not forget that. It’ll be no bigger than my 2-door Golf, most likely. This crossover will still be small. Let’s not forget that. Yup. Pretty sure that’s what I said. Thanks for a moment of clarity. I look back on the original Mini and see BMW doing many of the same things BMC did. If anyone bothered to look at the true lineage of the Mini they would see some interesting additions to the fleet. Yes MINI should build a pickup, a van, an estate, an Elf, and a Hornet. Let’s add AWD, a JCW kit and motor to the south of France and take the Monte back. Thanks, Nathaniel. I’ve been in favor of an AWD Mini for a long time. Sure would be useful here in Michigan. In fact, it might make winter driving fun. Been out of town. Nice to see a respectful discussion happening. I don’t agree with most of you but still cool to have an intelligent debate. I also don’t feel BMW is beholding to me… let me try this… Paul McCartney is one helluva a song writer on that most of us could agree, well his earlier stuff at least. He obviously can do whatever he wishes with his talent but I can’t imagine McCartney all of sudden putting out a “RAP” album. Probably would sell but what’s the point? Others do it very well, there is more than enough of it, it’s out of character for him so why would we need a “McCartney does RAP” CD or MINI does Escalade, H3, or Cayman? What’s the point! There was a comment here about the lineage of BMC. Hum seems the Riley and the Elf and so on were not a MINI derivative but a stand alone part of BMC or Leyland. The other MINIs mentioned were in the same size category of the original MINI, but please correct me if I’m wrong. I personally think, this SAV, SUV or whatever they are calling this thing is really a MNN (MINI Not Needed). All wheel drive yes but this, for me, nope. Was made aware of this post (and your blog, and the fact you stopped commenting on MF, sad to hear it) just yesterday when I was listening to the particular episode of WRR (I have some catching up to do, almost there). I think the biggest thing we have to keep in mind is that what a MINI is or isn’t doesn’t really belong to us. We (at least most of us) own MINIs, but we don’t own MINI. We’re passionate about the brand, and that’s awesome, but ultimately it’s the opinions of people like Gert who get to decide what is or isn’t a MINI. I think you’ve struck a central point there. To the US, Mini is a new brand, for most intents and purposes. Who else to decide what to do with it but the owner of the brand, right? Over here in Europe, for fourty years (or so), it has been pretty darn clear what a Mini was. (Ironically, the manufacturer didn’t really get to decide what a Mini was. They’ve tried releasing the Mini Metro, which evolved into the Rover 100. It was meant to replace the classic Mini, but the classic Mini outlasted it. Same thing for the original Clubman (square-nosed Mini); the “normal” Mini outlasted it).